GCDC spent considerable effort developing an easy to use and cost effective data acquisition product line. Our decades of engineering experience in the data acquisition field helped create a high quality product aimed at research professionals and hobbyists alike. Many of the exceptional features are apparent in the files created by our data loggers, such as the example below from the X6-1A product. The X-series accelerometer data loggers include a rich set of configuration options, including selectable sample rates, timing resolution, gain settings, data resolution, filter modes, and deadband. These features are listed at the start of each file to help the user interpret the data (A) . A complete list of features and instructions are described in the product data sheets. Our data loggers implement a real time clock (RTC) to provide precise timing of data. 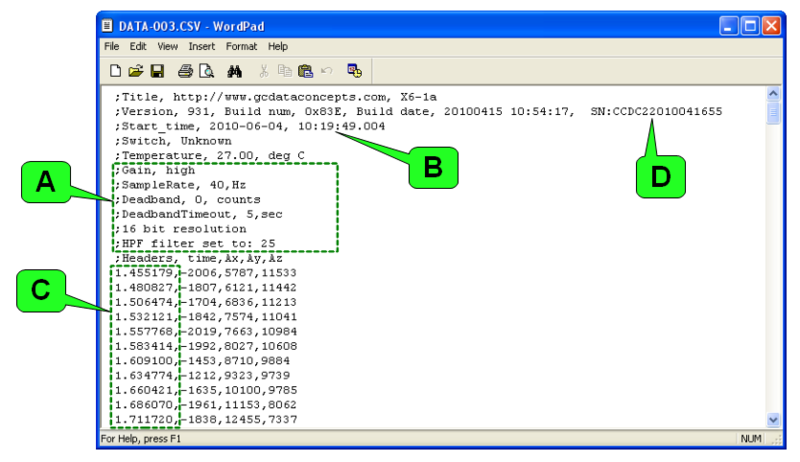 The RTC is used to mark the year, month, day and time of each data file (B) and to time stamp the individual lines of data. Therefore, each data sample includes a record of absolute timing. The RTC long term drift of only 2ppm allows precise synchronization of multiple data logger devices. Standard timing mode records the time stamp to 1 millisecond resolution and micro-resolution mode records to 0.1 millisecond resolution (C). Why is this important? The firmware code of each unit includes a unique serial number. This serial number is recorded at the start of the data files (D) to ensure traceability of the data. 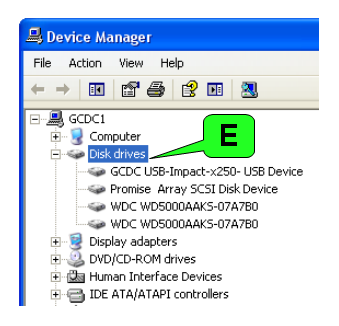 GCDC data loggers are USB 2.0 compliant devices and mount to computer operating systems as a mass storage device (E). Data is easily retrievable from the device because it appears as a standard disk drive with a directory containing the data files. Using a text editor, device options are set by modifying a configuration file located in the root directory. There is no need for special device drivers to operate the data loggers or access the data - simply plug the device into any computer. We ship our products with everything needed to start using your new purchase. A 2GB or 8GB memory card and a battery are included to make sure you have a functioning product right out of the box. The memory card includes the product user manual. We use a MEMS type accelerometer sensor similiar to those used in cellphones, laptops, harddrives and other consumer electronics. These sensors stream data at a selected rate based the on timing of a clock internal to the sensor. This sensor clock isn't perfect and the precision and drift are undefined. For example, a selected sample rate of 40 Hz may actually provide data at 42 Hz. The precise RTC of our data loggers is used to independantly time stamp the sensor data. This method ensures you know the exact sample rate instead of an assumed sample rate.